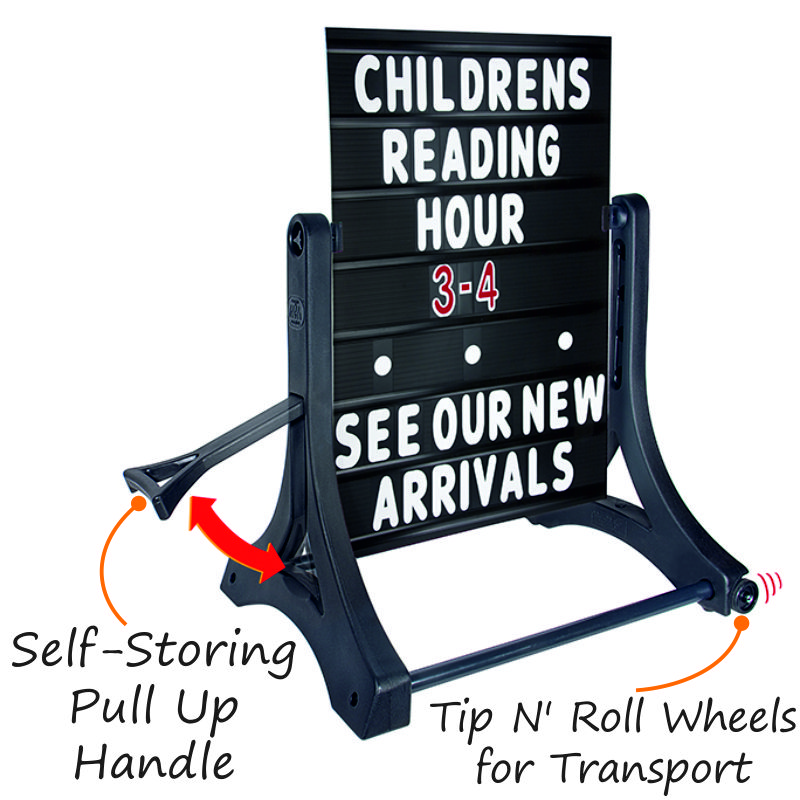 Contents Includes 1 sign holder comprised of 2 black sign uprights (one with a handle and one with wheels), 2 black cross tubes, and 1 set of assembly hardware. The STANDARD version comes with one - 24" x 36" x 0.5" (600 x 900 x 10mm) black message board with 7 letter tracks on both sides and one set of 314 - 4" letters, numbers, and symbols (white letters & red/white numbers). 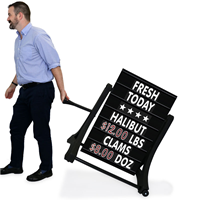 Take advantage of a sidewalk sign that can be transported and maneuvered easily with the help of tip n' roll wheels and a self-storing pull up handle. • Easily change messages with a selection of 314 - 4" letters, numbers, and symbols (white letters, red/white numbers) included with every order. • Comes with letter tracks on both sides to display messages up to 7 lines long. • Built-in handle offers easy mobility and maneuverability – you'll never have to carry it. Works great in bad weather and can withstand winds up to 30 mph. You don't have to worry about getting trapped outside while you're trying to move it. • Also available in White. • Alcoved 2.5" wheels are suspended above the ground and can be deployed by simply tipping the frame using the self-storing handle – providing easy transport or maneuverability. We had to replace our old NON rolling sign. This one was easy to assemble and we love how it rolls and has an easy to pull handle!